It’s a ‘Sadler’ teapot, one of quite a few we have in our collection, they are all gorgeous but we particularly like the colours on this one. 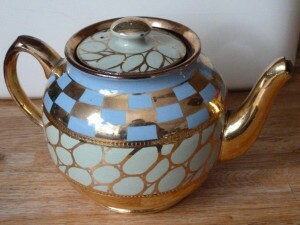 It will make an appearance at our next vintage tea party…it has already been used at home, couldn’t resist!! If you want to hire this or items like it please get in touch.